Regulatory reform has been a top priority in Korea for several successive administrations. Maintaining momentum for reform in Korea will be essential for producing tangible results and supporting inclusive growth, productivity and innovation. 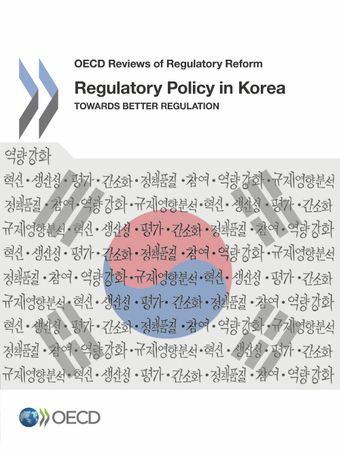 The Regulatory Reform Review of Korea provides key insights into a mature regulatory system and follows two previous Regulatory Reform Reviews of Korea completed in 2000 and 2007. It identifies a number of areas where improvements could help Korea reap the full benefits of the reforms introduced so far. It stresses the need for a clear strategy for regulatory policy in order to make better use of the resources deployed. Regulatory reform has been a top priority in Korea for several successive administrations. Recent reforms have included the Sinmungo petition system, which alerts the government to unnecessary burdens on business and citizens, and a "Cost-in, Cost-out" system that restricts the cost increase of new or amended regulations by abolishing or relaxing regulations that produce equal or greater costs. Korea also created a Regulatory Reform Committee (RRC), composed of government and public sector representatives, to scrutinise laws and regulations. A Regulatory Reform Office in the Office of the Prime Minister takes the lead in steering and overseeing good regulatory practices across the government of Korea and acts as the Secretariat to the RRC. Develop a clear strategy for the regulatory policy in order to make better use of the resources deployed. Better target reforms toward simplifying and improving the regulations and policies that are most burdensome for business and citizens. Promote a more proactive attitude to identifying and implementing regulatory improvements across the central administration. Encourage the private sector to share ownership of regulatory improvements and shift from focusing on complaints to finding solutions. Develop a more inclusive regulatory system, which can be achieved by opening up all institutions and processes, including the National Assembly, to public scrutiny and including a wider range of stakeholders. For further information, please contact Filippo Cavassini, Regulatory Policy Division, OECD.